← Toronto Beer Week – Day 0: Dieu Du Ciel! I feel it only proper that any city-wide beer festival should be kicked off with a ceremonial cask-tapping, preferably by a political figure of some sort. 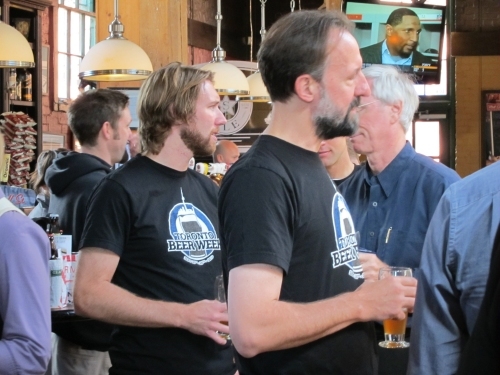 And apparently the organizers of Toronto Beer Week agree with me, as they put together a trade and media launch of the event yesterday at Mill Street Brewpub, with Speaker of the Legislative Assembly of Ontario, MPP Steve Peters, doing the cask-tapping honours at 11:00 AM. This is hardly the first time that Peters has been involved in a beer-related event. In fact, he’s a long-time fan and supporter of craft beer, and in his role as the Speaker, one of his initiatives has been an annual tasting at Queen’s Park to choose which Ontario craft beers will be served in the dining room and at catered events. So while his riding isn’t in Toronto, he was still a great choice to kick the week off. The cask he tapped contained Mill Street Oktoberfest – or a dry-hopped variant thereof, I would guess. Very tasty, although most agreed that it didn’t pair that well with the donuts and danishes that were spread out for snacking – for those, it was best to stick with coffee. An afternoon of domestic puttering followed, including an emergency run to Wal-Mart for a new vacuum cleaner when our old one started to spew smoke. 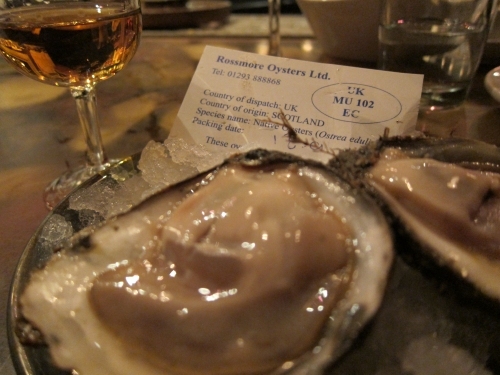 And then it was off to my evening commitment: Malt & Molluscs, a beer and oyster tasting at Starfish hosted by Stephen Beaumont and Patrick “Shucker Paddy” McMurray. 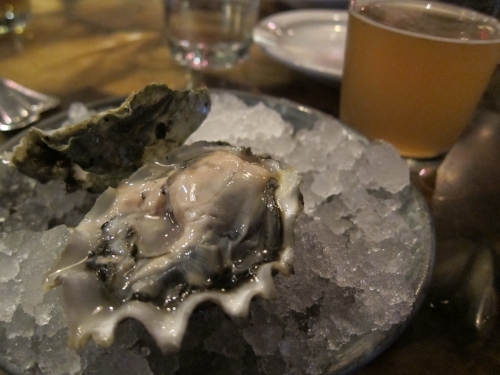 Actually, calling it a “beer and oyster tasting” is really selling it short, because it ended up being much more. Taking the “Malt” part of the name into a couple of different areas, Beaumont included not only beers in the pairings, but also a couple of very unique spirits, including a single malt vodka and a new whisky that is the first to ever be aged in Canadian oak. 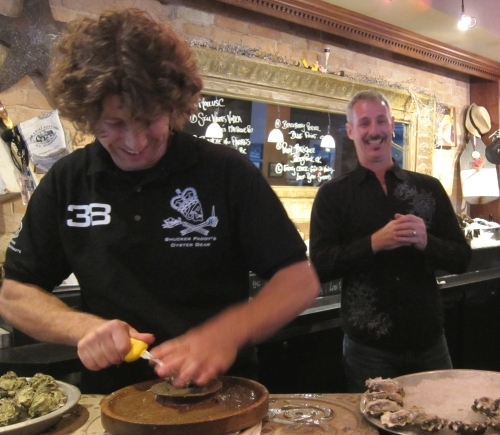 And McMurray – who is not only the owner of Starfish and one of the world’s top oyster shuckers, but also an expert on all things bivalve – absolutely blew us away with a line-up of six different oysters that included a couple of Scotland and the UK that are not available anywhere else in North America. 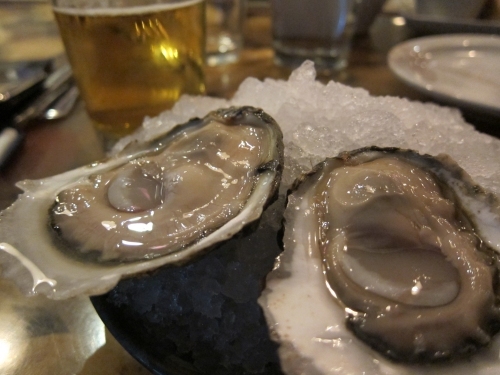 As is obvious from the photos, an oyster ain’t just an oyster. 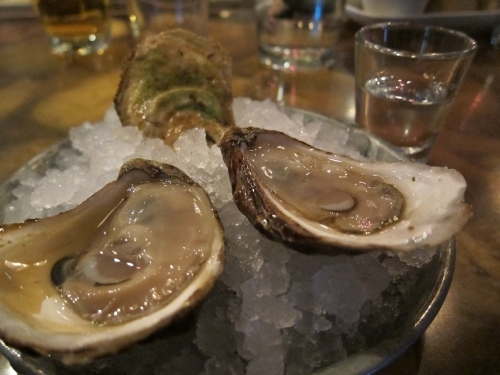 There are remarkable variations in appearance, aroma, mouthfeel and taste, with flavour notes really running the gamut: salt, brine, cucumber, melon, sweet, vegetal, steely, minerally, fruity, and much more. 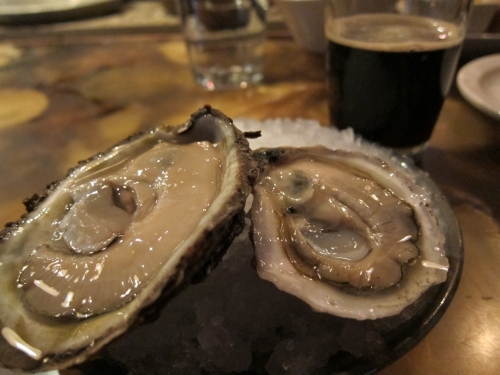 And the beers and spirits brought out even more from the oysters – and vice versa. Along with serving up the tasty delights above, both gents had plenty of stories and anecdotes to regale us with. 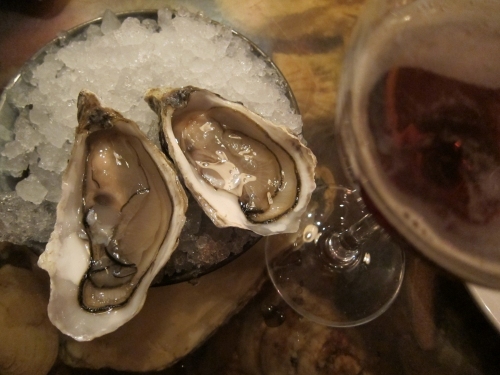 And once the oysters were polished off, Paddy called to the kitchen for a lot more food, including sardines, mussels, smoked crab, and heaping plates of french fries. I couldn’t stick around too long after the formal tasting ended, but the bits of the other dishes I had a chance to quickly try were in keeping with Starfish’s reputation as one of the city’s best seafood restaurants. Final verdict: An absolutely killer event from start to finish. If I had the time, I probably would’ve swung up to Volo afterwards, where they were apparently jam packed with people enjoying $4 pints of some of Ontario’s best beers as rated on RateBeer. But I didn’t, so I didn’t. Tonight: Brewdog dinner at beerbistro! Followed by me (and other beer writers) on stage at C’est What! Yikes! This entry was posted in beer events, food and tagged Toronto Beer Week. Bookmark the permalink.